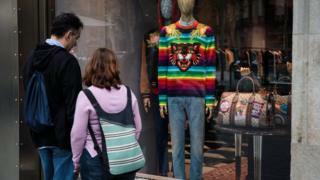 Kering, owner of luxury fashion labels Gucci and Yves Saint Laurent, expects a "record" year, amid strong sales growth, especially in China and western Europe. The French firm's revenue hit €3.9bn (£3.5bn) in the three months to the end of September, up 23%. Kering said the rising euro hurt its bottom line, affecting its overseas business. But growth prospects remain strong, despite that headwind. "The overall environment remains conducive for luxury goods and we are still well-positioned to continue out-performing the industry," chief financial officer Jean-Marc Duplaix said. Analysts have forecast growth for the luxury market in 2017, as economies around the world strengthen. Kering's hottest label was Gucci, which has drawn younger shoppers with colourful creations under designer Alessandro Michele. The brand's revenue increased 42% to €1.5bn in the quarter. Shoppers in China, who account for about a third of the label's sales, helped drive the growth. Sales at Gucci's Asia Pacific unit jumped 55% on a comparable basis, which adjusts for factors such as currency. Some of the surge was due to the launch of an e-commerce site in July. Mr Duplaix said that the firm was aware that such strong growth could lead to overheating in the market, but said they were working to protect the brand's exclusivity. The sales surge wasn't uniform across the company, however. At Bottega Veneta sales fell 4.5%. Mr Duplaix said the label was hurt in part by a stronger euro. He said the firm was pleased with progress at Puma, where sales climbed 13% in the quarter or more than 17%, after adjusting for currency changes. He declined to say whether the firm plans to sell or spin-off the athletics goods maker, despite repeated questions from analysts tracking the company. What's wrong with buying fake luxury goods?